GE says it’s developed the world&apos;s most powerful offshore wind turbine. ST.-NAZAIRE, France — At a brightly lit factory near the mouth of the Loire River, technicians in hardened black baseball caps gingerly maneuver wind machine tower turrets called nacelles across the floor and join them to big round generators. Then they roll the assemblies, which weigh hundreds of tons, onto the dock for shipment to a wind farm that General Electric is building off the coast of Germany. The Loire region is central to the ambitions that Boston-based GE has to become a force in the offshore wind-power industry, which is dominated by European companies. This fall, GE plans to expand and reorganize the plant to build test models for a new turbine with twice the generating power of the giant it is assembling here now. All told, GE’s offshore wind activities are providing about 450 jobs for people in the area like Édith Mas, who traded seasonal work at ski resorts for a year-round position maintaining turbines. “It is most important for me to have a contract,” she said before clambering up to operate a crane on a test machine near here. Offshore wind power has been something of a niche market, mainly thriving in countries like Germany, Denmark, and Britain, where environmentally friendly public and private sectors have invested large sums subsidizing what has been an enormously expensive energy source. Government policies have also encouraged a sizable industry in China. In recent years, though, advances in technology as well as competitive auctions for power contracts have sharply brought down costs. Wind developers have agreed to build giant wind parks off the Netherlands and Germany without any subsidies. Lower costs have widened interest in offshore wind outside Europe in countries like the United States, Japan, and South Korea. National and local governments are looking for cleaner sources to either satisfy growing demand for electricity or replace aging fossil fuel or nuclear plants. What could turn into an offshore boom appears to be taking shape on the US East Coast. Massachusetts and Rhode Island have recently chosen developers from Europe and the United States to build large wind projects off Martha’s Vineyard. The 6.5 cents per kilowatt-hour average price of the power for the 20-year Massachusetts contracts agreed to this summer came in lower than analysts expected. “We have certainly reached competitive price points with conventional power far sooner than had ever been anticipated here in the United States,” said Stephanie McClellan, director of the Special Initiative on Offshore Wind at the University of Delaware. Other states, including New York and New Jersey, are expected to follow. “This is a resource that has the potential to power a significant portion of not just Massachusetts but the East Coast,” said Stephen Pike, chief executive of the Massachusetts Clean Energy Center, a state agency. Iben Frimann-Dahl, an analyst at Rystad Energy, a Norwegian market research firm, forecasts that the market for offshore installations will grow to $87 billion in 2023 from about $35 billion in 2018. Wind and its offshore variant are already substituting for large volumes of emissions-producing fossil fuels in the power sector. Last year, Rystad estimates, wind accounted for close to 20 percent of new generating capacity installed globally. Offshore wind was about 10 percent of that slice but growing rapidly. GE’s entry for this market, called the Haliade X, will be 853 feet high. Each of its three propeller blades will be 350 feet long. GE says it will be capable of generating 12 megawatts, about a quarter more than anything else on the market. One of these structures, planted on the bottom of the North Sea, will spin out enough wattage to power a city of 16,000 homes, according to GE. GE says it is investing $400 million in research and development and other expenses to build the machine. The company won’t disclose the price per turbine, but industry estimates are about $14 million. GE hopes to begin shipping the new machine early in the next decade. Why build such a monster? GE executives say that customers have been asking for a larger turbine to help them lower the overall costs of producing electricity offshore. “The overwhelming feedback was bigger is better,” said Vincent Schellings, who is in charge of designing and building the Haliade X. 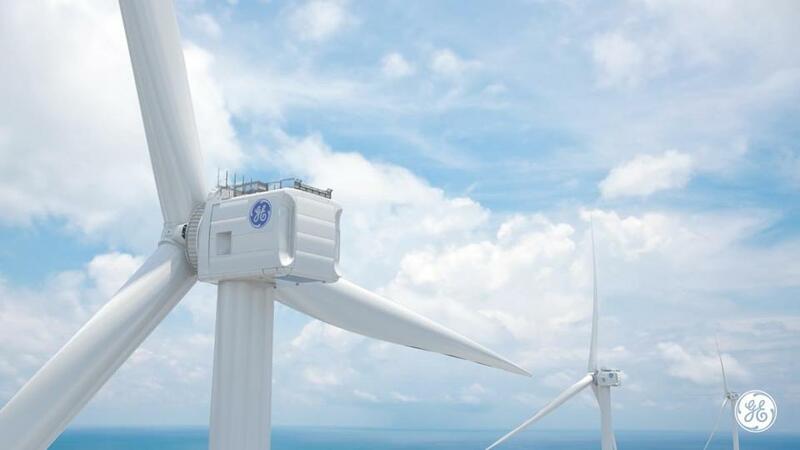 Analysts also say that as a small player in the offshore wind turbine market — less than 1 percent — GE also needed to make a striking statement. “They had to do something to get into this offshore market, which is becoming more attractive,” said Soeren Lassen, an analyst at MAKE, a research firm. He predicted that GE’s new machine will likely set off what he called an “arms race” among competitors.